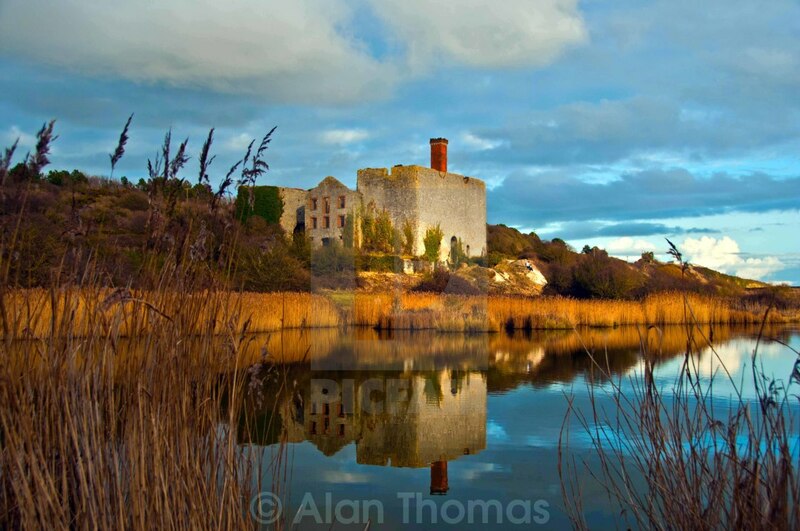 Aberthaw Lime Works is a derelict structure, located on the South Wales coast, between Fontygary Bay and Aberthaw Power Station. The structure is a Grade II Listed Building. The Lime Works was opened on 22 December 1888, by the Aberthaw Pebble Limestone Company. It was built to utilise the huge number of Limestone Pebbles that had previously been taken inland or been moved by boat. The Lime Works operated until 1926. The local limestone and brick structure is still largely intact, although it is missing most of its wooden components. It contains two vertical pot draw kilns each holding up to 300 tons each, which could produce up to 40 tons of burnt lime a day. Next to the main structure, there are two pot kilns which are also largely intact. These Kilns were built later than the main structure, but also ceased operation in 1926. The lime works were originally served by a tramway, which ran from the direction of Rhoose (east of the lime works). It passed either side of the now demolished winch house. A tramway ramp (again demolished) allowed carts containing pebbles between 3 & 4 inches in diameter to be conveyed to the top of the works and then into the kilns.